My son Felix on the course of today's cyclist test for 6th graders in Denmark, in Frederiksberg, Copenhagen. Today was a fun day in my son Felix' young life. 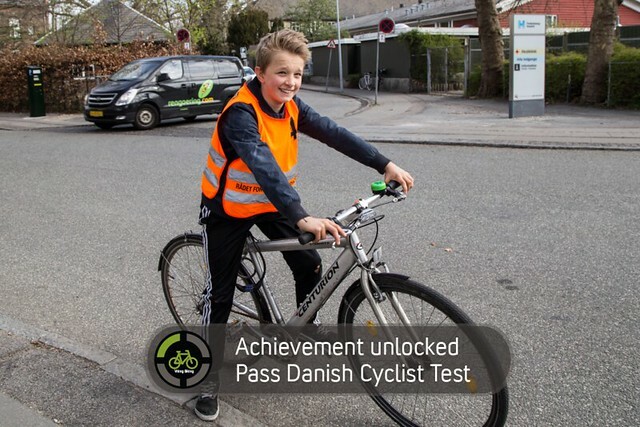 Together with the other 6th grade students at La Cour Vej School, he took part in the Danish "cyklistprøve" - or Cyclist Test. The test has been around since 1947. It's not mandatory but many schools choose to do it. When kids are in the 1st grade they get a week of initial cyclist "how-to" regarding rules of the road, etc. Then, in 6th grade, they rock the test like today. In my opinion, the test is great but it's also rather symbolic. Most of these kids have been cycling in the city since they were little. Felix has rocked the cycle tracks since he was three and a half. Parents teach them the rules and, most important, give them the practice they need. By the time they get to the 6th grade, the majority have a great deal of on-asphalt experience on their bicycles. 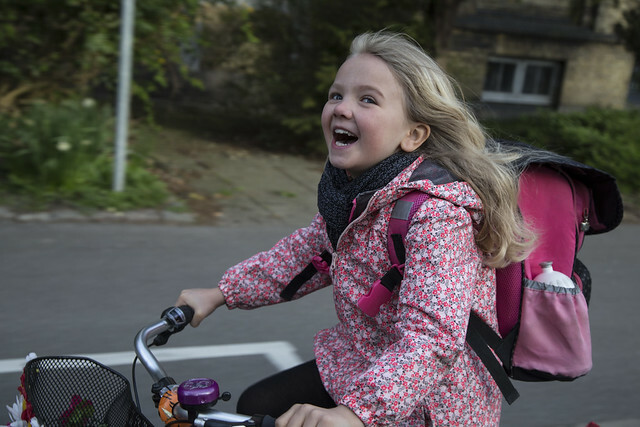 Our school chooses to make passing the test a pre-requisite for going on outings by bike when they get older. Today's test almost didn't happen. The police are involved, as a rule, but because of the Copenhagen shootings earlier this year, they say they don't have the resources. They put a lot of resources into investigating and rounding up other potential terrorists, sure. But they have also spent a pile of money on positioning policemen armed with heavy weapons around the city. A symbolic gesture to "make us feel safe". An expensive, symbolic gesture that had little effect on Copenhageners. Right THERE, they could have saved some money and still helped do the cyclist test. Some schools, however, took matters into their own hands. The principal of La Cour Vej School, where both my kids attend, said today that they chose to find the resources in THEIR budget to do the test anyway, because it is very important for the kids and for traffic safety that they take the test. So, at 7:40 this morning, me and five other parents showed up and were handed clipboards with the grading sheets. We each chose one of six posts to stand at and off we went. I had a sunny bench at the roundabout outside the school when the kids were on the home stretch. The route has a bit of everything. All forms of bicycle infrastructure, all levels of volume. Busy streets, quiet residential streets and lots of turns. Earlier this week the kids had a theory test and they all walked the route with their teacher. The kids start off with 300 points and each mistake subtracts from that. Here's the list. I had to watch them enter the roundabout and exit it again. Checking them for shoulder checks, giving way, signalling. So after spending four hours on a street corner waiting for over eighty 12 and 13 year olds to pass, how did it go? I was impressed. They rocked it. The vast majority rode like a boss, with confidence despite the nervosity of performing a test and trying to get everything right. Like I said, most of these kids have been cycling in the city for years so it wasn't really a stretch for them. Merely a fun refresher course. Some were less confident on the bike, but none were perilous in their cycling. One poor kid got totally lost on the route and ended up in the Nørrebro neighbourhood. He wasn't in school on the day the kids walked the route and even though he had a map he still got a longer bike ride than he expected. Some kids bunched up a bit, even though they weren't supposed to. The 2-3 minute interval was generally good at spreading them out so they were on their own, finding their way on the urban landscape. I haven't seen the final results but when us six parents met up afterwards we had a chat. There were few dramas out there. Another day in a bicycle-friendly city. I can't see how any of the kids would fail the test, apart from the kid who got lost. I hope he gets another shot at it. Normally, when the police are involved, if a kid fails they send a letter to the parents informing them that their kid needs some more practice. Regarding my kid, Felix, I had informed him beforehand that as MY son, I would tease him until the end of time if he failed. He didn't and I knew he wouldn't. You can, however, see how the Culture of Fear has influenced things even here in Denmark. In the emails leading up to the day it was stated that helmets had to be worn. I informed the teacher responsible that Felix doesn't wear a helmet and a longer discussion ensued. It's clear that the Danish Road Safety Council have influenced a lot of people with their wacko ideology. I was informed that the school's traffic policy requires helmets. I looked it up - it doesn't. They merely "urge" students to wear them. I was told he could borrow a helmet. I asked if they were washed and disinfected. They weren't. Then I was told it wasn't up to the school but that I would have to talk to the Danish Road Safety Council or the police. I responded that the Road Safety Council is just an NGO and has no power and the police merely refer to the Danish traffic law which doesn't require helmets. At the end of the day I was told I could sign a form exempting Felix from wearing a helmet. Fine. Except there is no form and Felix just did as he pleased. This is not America, but sometimes you wonder if it is. The battle for rationality and respect for science continues. The main takeaway for me today was seeing eighty kids riding like bosses. Owning it. Rocking the old cycling test and having fun doing it. Cheering their fellow students when they left the start area. Cheering when they got back. It was awesome. Felix is totally pre-teen at the moment but he was clearly proud to complete the test. And I'm a proud dad. Next up is The Lulu. She's in 1st grade but she already owns it. She'll be awesome, too, by the time the test comes around in five years.